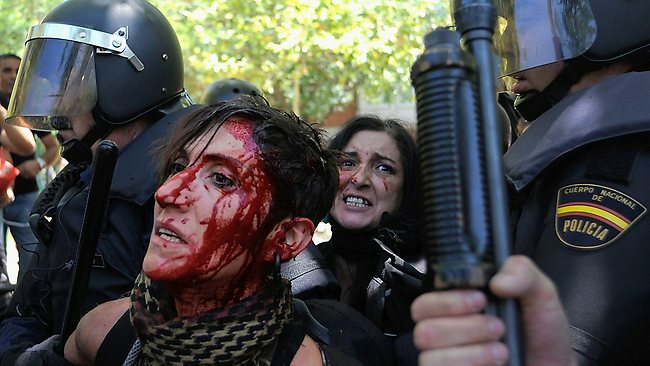 Dozens injured as riot police attack striking miners and their sympathizers in Madrid while Spanish government announces further austerity measures. The crisis of European capitalism took a major turn for the worse on Wednesday as the Spanish government made a radical U-turn by announcing even deeper austerity measures to the background of some of the biggest and most radical anti-austerity protests to have rocked Europe in months. While thousands of miners and tens of thousands of sympathizers clashedwith riot police during their march on Madrid’s iconic Puerta del Sol, Prime Minister Rajoy told Parliament he would raise sales taxes, slash unemployment payments, raise the retirement age and reduce civil service pay. At least 73 were injured as riot police indiscriminately fired rubber bullets into the crowds and protesters retaliated by throwing bottles, trash and fireworks back at police. Images circulating on Twitter showed a journalist lying injured on the ground and a young child (below) with a massive bruise from a rubber bullet. One particularly disturbing image showed a woman bleeding protrusively from the head as she was being led away by riot police. The clashes are remarkable because, in contrast to Barcelona and Athens, protests in Madrid have tended to stay relatively peaceful so far. Perhaps Wednesday’s violent clashes are a sign of times to come? If the struggle of the miners is anything to go by, this certainly seems likely. On Tuesday, while Spain’s borrowing costs continued to hover dangerously close to the 7 percent benchmark at which Greece, Portugal and Ireland previously required full EU bailouts, hundreds of striking miners arrivedin Madrid after an 18-day march from the Northern region of Asturias. The miners, who have been fighting against the government’s plans to slash subsidies to the coal industry, received a hero’s welcome to the capital as thousands of sympathizers lined the roads. The slashing of the mine subsidies from 301 million to 111 million euros threatens to shut down the entire industry, putting the livelihoods of 8,000 miners and their families on the line. Entire villages could disappear and a total of 30,000 people could be affected. The irony, as one of the miners wrote in a letter published at libcom.org, is that the strikers don’t even want the subsidies to be continued indefinitely — they merely want the government to stick to a previous EU agreement that would see the fading out of subsidies by 2016. They don’t want a hand-out; they merely want the state to keep its word. In recent weeks, the striking miners have literally catapulted themselves to the forefront of the deepening European class war. Opposing the fanatical austerity drive of the EU and the Spanish political establishment, the miners have pointed out that the 301 million coal subsidy pales in comparison to the 24.5 billion euro subsidy that was recently given to the failing banking conglomerate Bankia — and they have done so not just by peacefully occupying a city square, but by actively engaging in systemically disruptive direct action, including road blocks, mine occupations and the sabotage of rail lines to block train-based coal transport. As such, the miners have also made a point of distancing themselves from the non-violent protest of the more middle-class indignados. Indeed, one of their key slogans has been: no estamos indignados, estamos hasta los cojones — we are not indignant, we are fed up to the balls. As riot police intensified their crackdown, the closely-knit miner communities organized nothing short of a popular guerrilla army, using homemade rocket-launchers, catapults and shields to fight back lines of invading antidisturbios. Even non-participating locals have been broadly supportive of the actions, as the shutting down of the mines would certainly spell the end of their communities and a drastic drop in the value of their homes, whose mortgages they still have to pay off.